He's doing well.......I'll devote a blog post to him at some point over the next couple of days with pic of his new skinny bod and bazillion staples......LOL. Now, for the reason you are here! This weeks Scrap It With A Song Challenge!!! Think ya'll are ready? This week we have an incredible sponsor!! 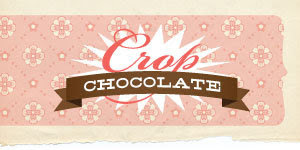 Crop Chocolate!!! I just loveee chocolate and this kind is the best......LOL. So our song this week is one I have to admit I am not familiar with. The ever so popular Jessica Simpson....who knew she sings? LOL. I really liked the lyrics to this song tho.....this week we are working with the song "With You"
Now ain't that just the sweetest??? Awwwwwww!!! Yeah I know.......good grief that's a lotta pink!!!! LOL. Totally uncharacteristic of me, so don't exdpect it again anytime soon. I think I have used up my yearly pink allowance all in one LO......LOL. I got "digi with it" here and used a really cool kit from Kasia Designs called "Made With Love" It's very girly......but it has some great papers and embellishments....even for a girl kit.....LOL. I did my font in white to attempt to mimic journaling with a gel pen. So cmon over and play with us this week! Amazing song inspo, amazing prize, and just a whole lotta fun! !